We wouldn’t be here without you, Moms! 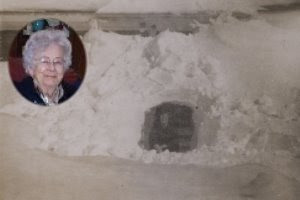 While writing the last story about digging out of a Maine blizzard, I wished I could find the tunnel photo of my Mother at the entrance to our porch. Wish granted. The photo here was found and scanned moments ago and shows my Mom in the snow tunnel needed to enter the main entrance of our home in Derby, Maine, after a blizzard in the mid-1960’s. The inset is a recent photo of her. Imagine waking at 5:00am to go potato picking in the freezing cold in Maine. I forget how many consecutive days just the two of us endured that back busting work, but it was probably a week. The reason was spare cash to buy me a trumpet, and I was probably too young to have contributed much real work. As kids, the sacrifices (and ingenuity) of moments like that sometimes take years to strike a nerve. Thanks, again, Mom.